Only a few varieties of woodpeckers will live in a man-made box, but the Hairy, Red-headed and Red-bellied Woodpeckers regularly do so. 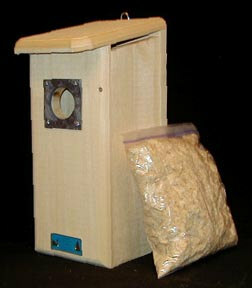 This house comes with wood chips and a slate predator guard to keep squirrels from enlarging the entrance hole. RANGE: Resides throughout the U.S. and Canada, and north to Alaska. Some northern birds move south for the winter. HABITAT: Lives in or at the edge of open woods, prefering deciduous forests.